What does Jesus piece mean? A Jesus piece is a piece of jewelry, often made of gold or silver and associated with hip-hop culture, depicting the head of Jesus. The term can also refer to a crucifix. I’m triple blessed so today I’m rocking the jesus piece! Wearing his Jesus piece on a Cuban link chain allows him to speak his mind and keep his cool (by refraining from using his piece, which is slang for gun). Where does Jesus piece come from? The tradition of wearing Christian iconography as jewelry goes back for centuries, but the term Jesus piece specifically names a type of necklace, usually made from a precious metal such as gold or silver, and with Christ’s head as a pendant, sometimes with his crown of thorns adorned with gems like diamonds. Jesus, here, refers to the Christian religion’s central figure and piece, an example of fine workmanship or jewelry. A Jesus piece is not something worn by a particular Christian denomination, but rather, as a symbol, fashion statement, or bling within the hip-hop community. One early and influential Jesus piece was worn by rapper Christopher Wallace, better known as the Notorious B.I.G. or Biggie, who is said to have purchased three of them for $30,000 from his jeweler, Tito Caicedo. The Jesus piece hanging from Biggie’s neck became strongly associated with his rap persona. He even referenced it in his song “I Love the Dough” from his hit 1997 album, Life After Death: “You seen the Jesus, dipped to H classes.” In the song “Hypnotize” on the same album, he raps: “So I just speak my piece, keep my peace / Cubans with the Jesus piece…” This line popularized the term Jesus piece as its now popularly used. It’s worth noting that the term piece is also slang for gun, so his phrase Jesus piece creates a compelling juxtaposition of wealth, violence, and religion. In 1999, fellow rapper Jay-Z appeared on the cover of the hip-hop magazine XXL wearing a Jesus piece, speculated to have been one of Biggie’s original three. Jesus pieces didn’t hit the mainstream, however, until 2004, when they became a signature adornment of artist Kanye West. West partnered with jeweler Jacob Arabo to create an entire line of religious hip-hop jewelry. He also frequently mentions Jesus piece in his songs, helping cement the term, and accessory, in hip-hop culture. Rapper The Game, for instance, since titled a 2012 album Jesus Piece. The phrase Jesus piece is primarily used in hip-hop music and culture to refer to the jewelry or its various symbolism. 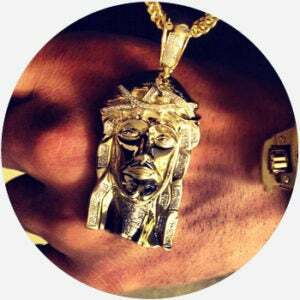 While the original Jesus pieces feature Christ’s head, the term has extended to other Christian-themed hip-hop jewelry, including crucifixes. Some Christians object to the treatment of religious iconography as jewelry, especially ornate items that run counter to their beliefs about Christ’s humility. Other Christians object to the use of Jesus piece in explicit contexts. Hip-hop artists, however, have long drawn on Christianity, and Jesus piece is often portrayed as a talismanic check on violence or a representation of their rise out of poverty through faith.